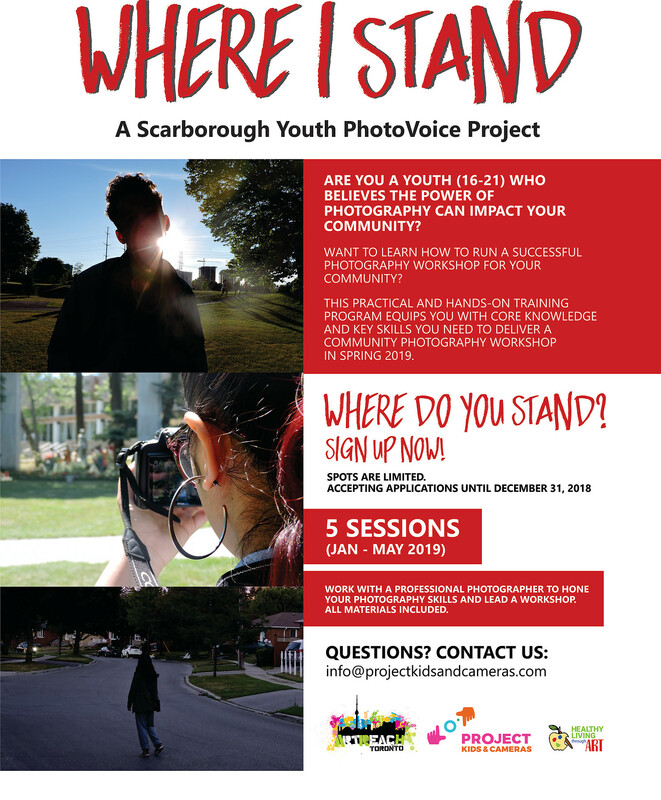 “Are you an artist or educator interested in bringing your artistic and cultural activities to Scarborough? Scarborough Arts is looking for engaging individuals to be part of our artist roster and plan and lead enriching arts workshops, talks, and events in Scarborough as part of our annual SA Suite of Programs 2018-19! This year, we are especially interested in proposals that plan on delivering a series of workshops that will allow participants to progressively build on their skills. DEADLINE: September 23, 2018 at 11:59 PM EST. 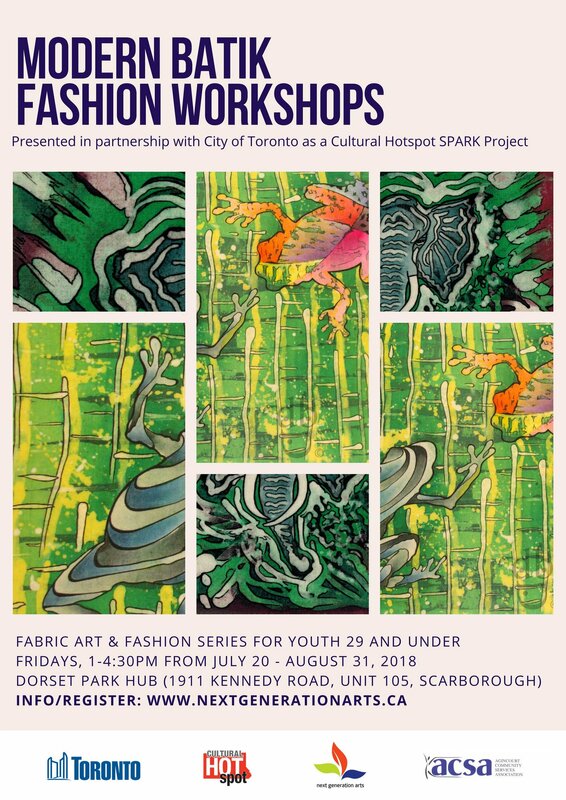 “Presented in partnership with the City of Toronto – Cultural Hotspot SPARK Project and Agincourt Community Services Association – Dorset Park Hub, this workshop series explores the ancient African art of Batik, waxes, dyes and inks and applies it to fashionable fabric pieces which participants are free to alter. At the end of the workshop series, participants will show off their creations in a fashion show event. StArt Youth Presenting Art [StArt YPA] is a SuiteLife Arts for Youth initiative, run by Scarborough youth and sponsored by TD Bank and Theatre Scarborough. We strive to give young emerging artists in Scarborough alternative outlets to express themselves in the arts and provide them with a platform where their works are accessible to their communities. 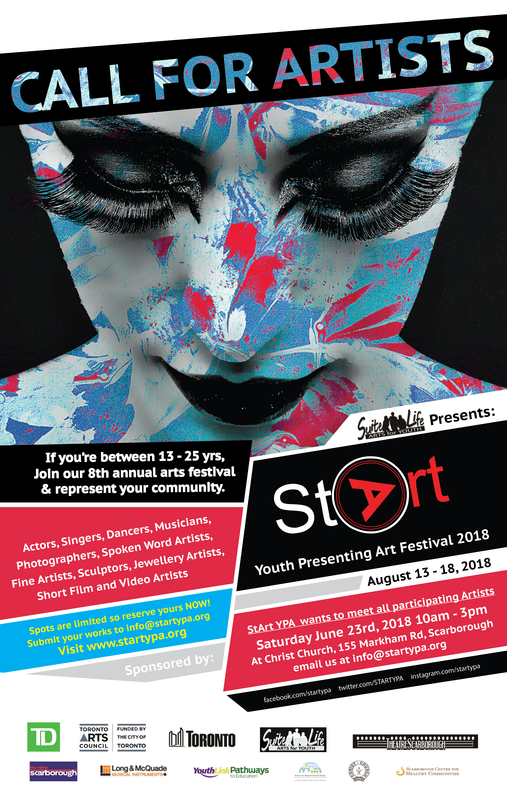 StArt YPA is now accepting art submissions for our 8th annual StArt Youth Presenting Art Festival, being held from August 13th to 18th, 2018. 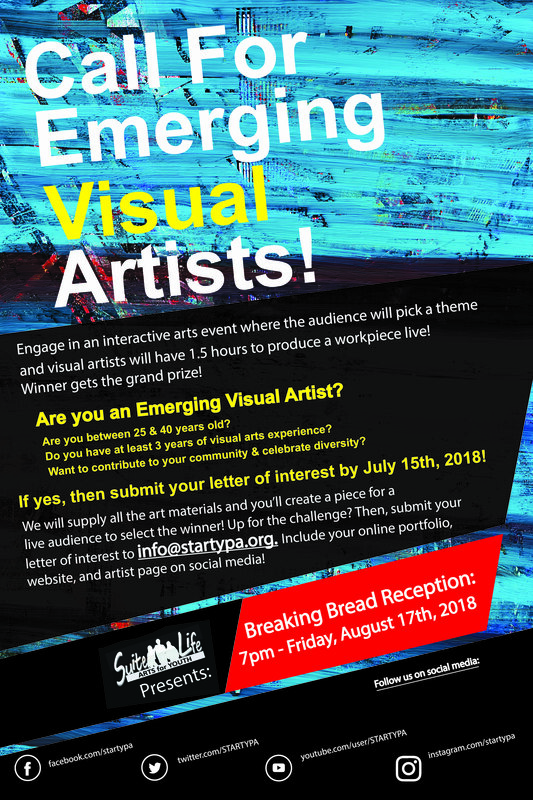 All youth between 13 and 25 years old are welcome to submit their works by July 14th, 2018, to info@startypa.org. Include subject line “Art submissions” and e-mail us links/docs of your work and a statement about you (including name, age, e-mail and phone number) and tell us about who/what inspires you as an artist. “Art Starts is looking for youth ages 15 to 22 interested in visual arts living in North Scarborough! 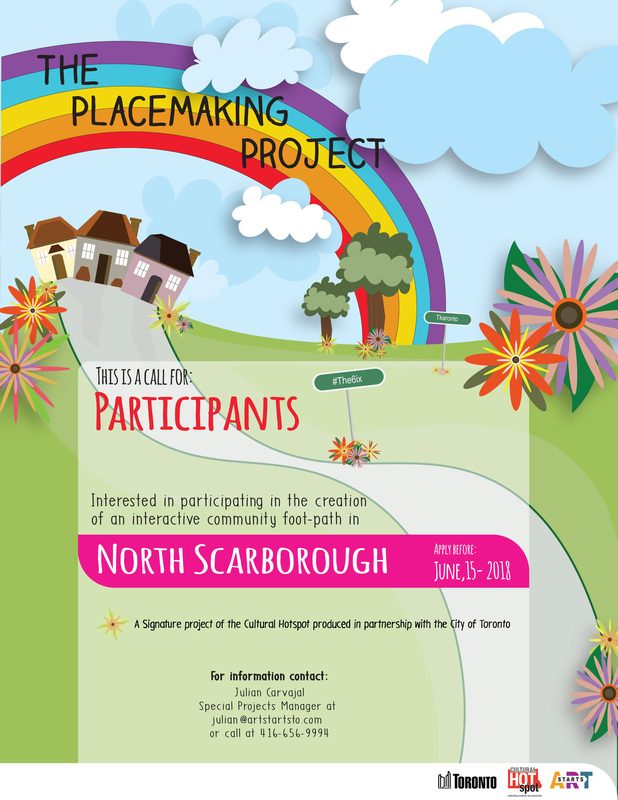 The Placemaking Project will bring together youth from North Scarborough to work with experienced artists to animate two public footways in north Scarborough. Growing out of a community consultation process, each artistic project will inject a burst of colour, intrigue and warmth into areas identified by the community as dull concrete places – leaving behind prominent, long-lasting public art installations that will insert a sense of fun and beauty into the neighbourhood. A fun, festive ribbon cutting celebration, with land acknowledgement by Indigenous Storyteller Maria Montejo, will take place after the culmination of the project. See website for more details. 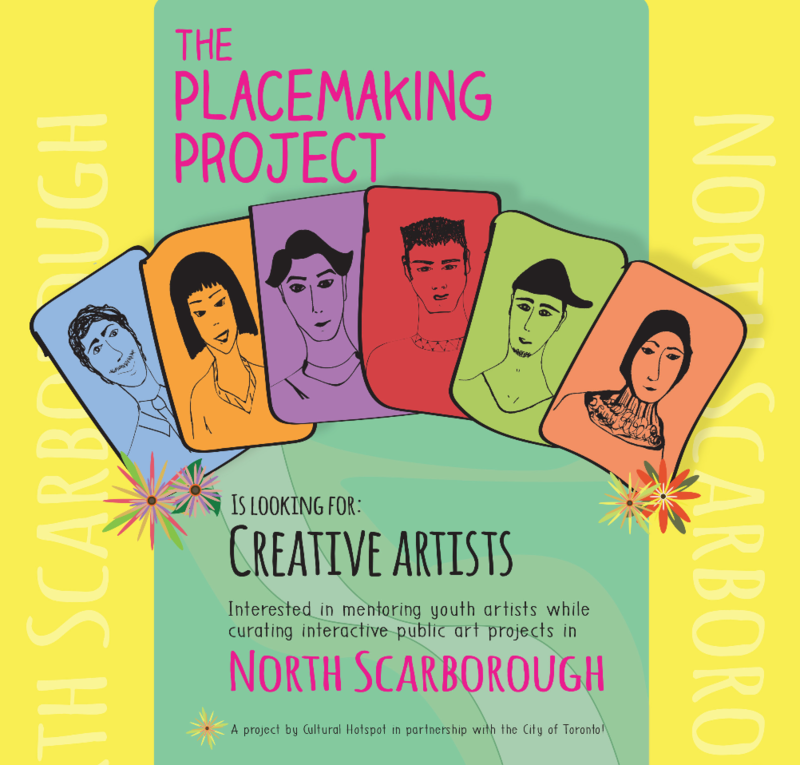 The Placemaking Project will see youth and professional artists consult, design and craft 2 permanent public art installations within the (Scarborough) Cultural Hotspot boundaries. To ensure local excitement, resonance and a high-quality outcome, the installation locations, type and lead artist/s will be determined following community and stakeholder consultations. Creative initiatives may include long, colourful sidewalk murals, funky signage, stair décor, etc. Professional artists will work with 6 youth (YOU). The artists will mentor YOU in the conceptualization, design, crafting and implementation processes. Together they will consult with local representatives (e.g city councillor, residents) and spend over 40 hours conceptualizing, designing and crafting murals that animate and beautify. *This is a paid training opportunity for local youth to learn employment-ready skills, illustration, practice collaboration and creative thinking with a professional Visual Artist and senior Special Projects Manager. 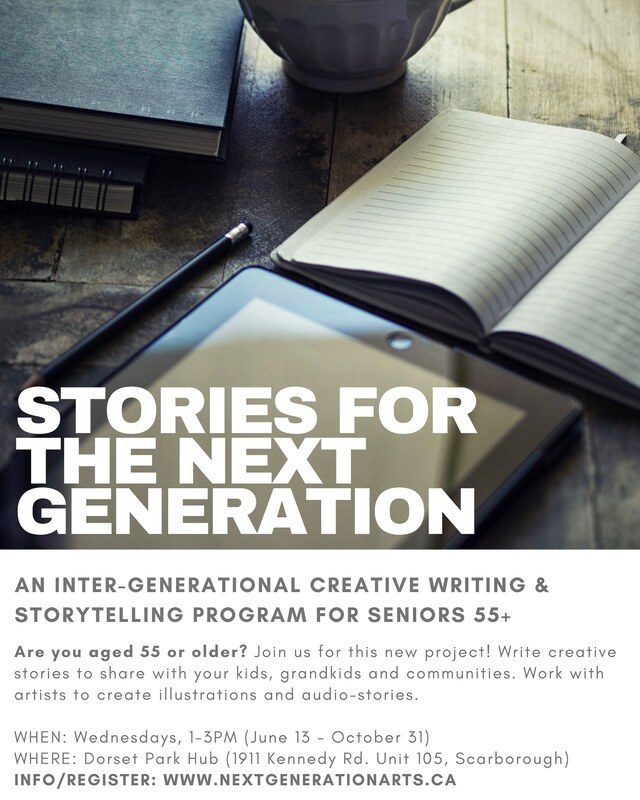 “Stories for the Next Generation is a free intergenerational storytelling workshop series for seniors ages 55 and older to share with their families and communities. Over the course of the series, senior participants will work with a professional storyteller to create enticing creative writing pieces. Participants will record their stories with their children and grandchildren to create a collection of audio-stories and will also work with an artist to create a visual companion to their stories. All items will be published into a compilation of stories. This free series is hosted every Wednesday (1-3PM) from June 13 to October 31 at ACSA – Dorset Park Hub (1911 Kennedy Road, Unit #105, Scarborough). 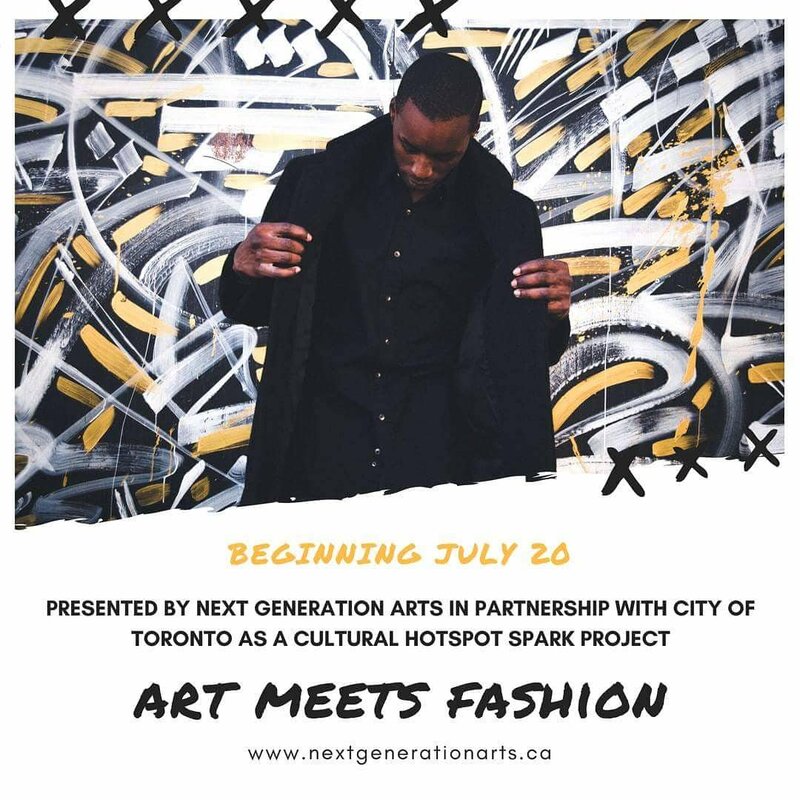 “The Placemaking Project will see youth and professional artists consult, design and craft 2 permanent public art installations within the (Scarborough) Cultural Hotspot boundaries. To ensure local excitement, resonance and a high-quality outcome, the installation locations, type and lead artist/s will be determined following community and stakeholder consultations. Creative initiatives may include long, colourful sidewalk murals, funky signage, stair décor, etc. Professional artists (YOU) will work with 6 paid youth. The artists (YOU) will mentor them in the conceptualization, design, crafting and implementation processes. The youth will be mentored for 360 hours (collectively) by professional artists and a Senior Project Manager. The Placemaking Project brings together youth and lead artists to animate 2 public areas in North Scarborough. Each artistic project will inject a burst of colour, intrigue and warmth into dull, lifeless, concrete places, asserting a sense of fun and prominence into the neighbourhood. A fun, festive ribbon cutting celebration will take place after the culmination of the project. Scarborough Worldwide Film Festival Seeking Volunteers! “Scarborough Arts invites you to volunteer for this momentous 5th year of the Scarborough Worldwide Film Festival! The festival runs from June 6th to 11th, 2017, and this year is promising to be the best one yet, with a variety of film programs, parties, concerts, industry meetings, guests, and of course more films! To apply for a volunteer position please complete this application form. “Are you interested in writing and performing your own music? Are you between the ages of 14 and 21? 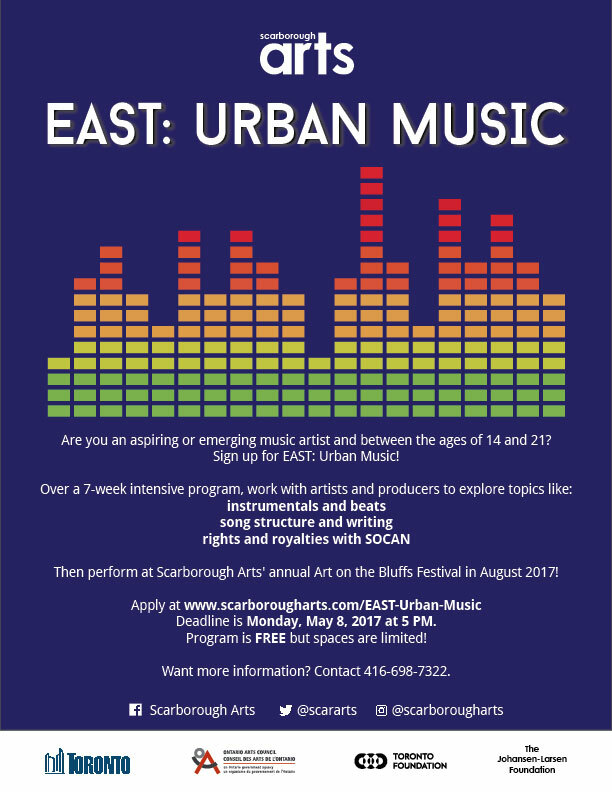 Sign up for Scarborough Arts’ EAST: Urban Music program! Work with musicians and producers and learn about beats, songwriting and song structure, flow, performance, and artists’ rights with SOCAN. At the end of the program, participants get to perform their songs at Scarborough Arts’ annual Art on the Bluffs festival (previously Art in the Park) in Scarborough on August 2017. Workshops take place Thursdays, 6:30-8:30 PM at Cedarbrook Community Centre, 91 Eastpark Blvd., starting May 11 until June 22, 2017. Deadline to submit applications is Monday, May 8 at 5 PM.